I know the DLC joke couldn't match last year's, but I had a lot of fun writing it. Anyway, the new demo is almost ready for a release. 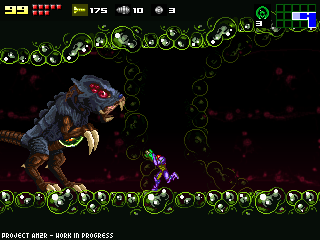 The miniboss of Area 3 had several revisions, and it's still being tweaked during the final playtest sessions. As usual, as things get fixed and features are added, other things break. Sometimes it feels like a never ending loop. But things look pretty stable nowadays, just a couple of (hopefully) simple bugs left to fix. I know I entered into a "feature lockdown" to focus on the contents, but there was a feature that was requested a lot: Centralized menu controls. Now, first time players might find the subscreen controls a bit confusing (almos nobody reads the commands at the bottom of the screen), so I limited all the actions involving menus to 2 dedicated, customizable buttons. This is a small detail that makes things much more intuitive. Anyway, as for a release date... I will have a definitive date soon. I'll post much more often as things develop, so please check back next week. Thanks for following the project, and for all the awesome support! Keep it up Doc ! Thanks for your hard work, i look forward to release. I was fooled by your post yesterday..."Do we really have to pay for in-game missiles and tanks?" Keep up the awesome work...I'm looking forward to the demo very soon. Awesome Doc, I'm looking forward to it. Oh and by the way, your April fools day joke was great XD. Great! I will wait up for play the awesome new demo. Btw how much areas are in the game? For thinking how much percent of the game is finished, I never played metroid 2 more than 30 seconds. Thanks for all man, you are a true hero! It's like a movie trailer, for example, Gravity. I watched the trailer and it was like "OMFG!" then, when I saw the movie, I realized they have showed everything in the trailer! The movie was just mediocre! I certainly don't want this to happen to this awesome game. Been following you for 3 years now! Or more! I am always excited to check out the website for updates! You are getting so close! Keep up the good work. It will pay off big time, and be well worth the wait! Is it possible to add dpad support for gamepad users? dos proyectos geniales: AM2R y Magus-Master Of Shadows. Please put speedrun options like in confrontation. Saludos desde Merlo, Buenos Aires. Amazing! Ive been keeping an eye on this for a while now and i can't wait. Quick question when you fully complete this what are you going to do with it? Getting Pumped for the release of this awesome project. Its been a long wait but its gonna be worth it. Yo man, keep up the hard work, I'm sure it'll pay off in the future! Antes que subas el demo, ¿Puedes hacer que el juego avance más rapido en Windows 8?